Exiting L'Amorosa follow signs to Petroio, then to Castelmuzio. Just before reaching Castelmuzio turn left in the direction Pienza. At the top of the hill turn right, following the signs to Sant'Anna in Camprena . The interiors of this monastic complex are particularly interesting, and include a small refectory with frescos by a young Giovanni Antonio Bazzi. Close by, for those who would like to learn or perfect their Italian, there is the Language and Culture school of Sant'Anna in Camprena . After having returned by way of the tarmac road you will see, on your right, signs for: SS2 Cassia and Siena, take this gravel road and keep going until you get to the old Via Cassia, once back on the tarmac road, turn left. You will have just travelled through the heart of the Crete Senesi, via Cosona, with it's Renaissance Palace, and Celamonti, an old farmstead. This is the world of the Via Francigena, the ancient pilgrim route from Canterbury to Rome, which passes through the beautiful landscapes of the southern part of the province of Siena. Once you reach the old Cassia turn left, and negotiate the same curves which challenge drivers participating in the famous Mille Miglia road race, until reaching San Quirico d'Orcia. This is the town where Popes, Emperors, Saints and Pilgrims all took respite from their travels. Parking spaces are located immediately outside the walls. First recorded mention of the town dates back to the year 714. From the 12th century onwards, its importance continued to grow and grow, partly due to its strategic position on the Via Francigena. The town's architecture testifies to its past splendour. When you are ready to continue your journey, ask for directions to the "strada bianca (gravel road) per Ripa d'Orcia e Vignoni" . Pass the Castello di Vignoni which in 1051 belonged to the Abbey of Sant'Antimo. 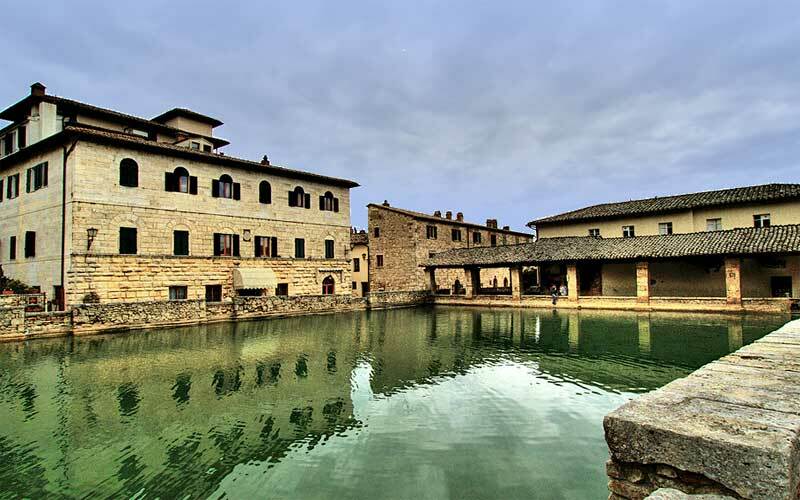 Travelling through a unique landscape, you descend towards Bagno Vignoni, where you can see the ancient thermal baths in the centre of the village. Back on the Via Cassia, running beneath Bagno Vignoni, turn right following indications for Roma and again right for Castiglion d'Orcia. En route stop at Rocca d'Orcia, a delightful little village built under the Rocca di Tentennano . Its history and panoramic setting make a visit to the Rocca (fortress) worth while. You can reach it by climbing up from the village of Rocca d'Orcia or, more comfortably, by car from Castiglion d'Orcia. There is so much history in each stone, church and farmhouse in this area that it is impossible to suggest what to visit, just look around, wander leisurely and enjoy the landscape. From Castiglion d'Orcia you can return taking the road to San Quirico then to Pienza and on to Sinalunga. 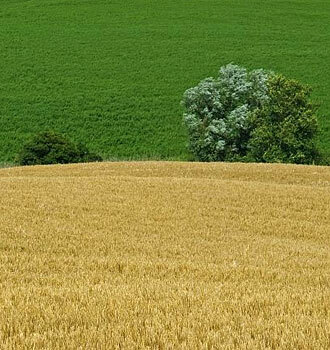 If you wish to continue your tour, the Val d'Orcia has many more beauties in store for you. For example you can climb towards Mount Amiata and visit the hermitage of Vivo d'Orcia, which during the XII century housed a community of Camaldolesi monks. The hermitage was converted during the XVI century into the imposing Palazzo Cervini, the design of which has been attributed to Antonio da Sangallo the younger. 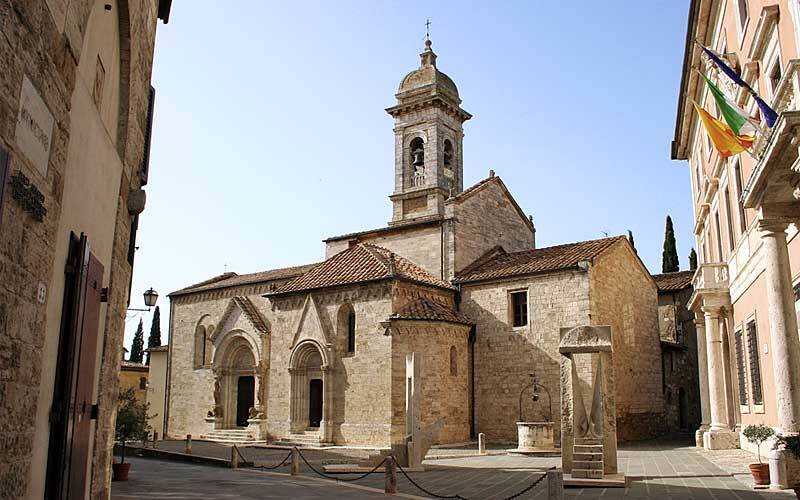 Visit the Ermicciolo and the delightful Romanesque church of Saint Benedict hidden within the chestnut woods. Close by, lies the spring of Sorgente del Vivo which, since 1934, has supplied water to Siena and it's environs, including the Amorosa. Continue to Campiglia d'Orcia, where a panoramic road will take you back to the via Cassia. Turn left and then, after the few houses of Gallina (where you will find a curious sign marking the 43° parallel), turn right following signs to Pienza. 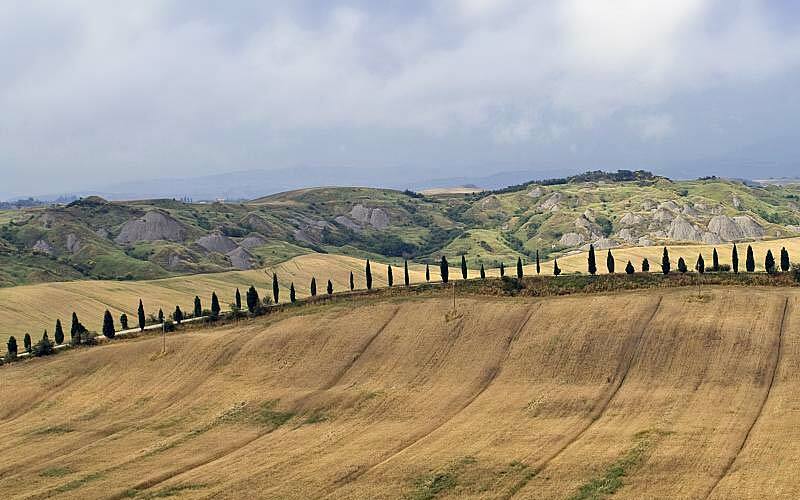 You will reach Pienza by way of a spectacularly panoramic road. Once in Pienza follow signs for Sinalunga and return to L'Amorosa, where a relaxing candlelit dinner awaits.